PreStage imaging allows you to store imaging settings in Jamf Pro and use them to image new computers as you add them to the network. This reduces the amount of time and interaction it takes to prepare new computers for use. PreStage imaging also enrolls computers with Jamf Pro. To use PreStage imaging, you need to create an Imaging PreStage in Jamf Pro and then run Jamf Imaging on target computers to image them. Creating an Imaging PreStage allows you to configure the imaging settings and specify the computers that should be imaged with the Imaging PreStage (called “scope”). When you open Jamf Imaging on a computer in the scope, Jamf Imaging is populated with the settings in the Imaging PreStage. You can configure an Imaging PreStage to start the imaging process automatically the first time Jamf Imaging is opened on a computer. Otherwise, you need to start the imaging process manually by clicking the Image button in Jamf Imaging. You can also bypass PreStage imaging to prevent Jamf Imaging from being populated with the settings in the Imaging PreStage. Use the General payload to configure basic settings for the Imaging PreStage, including the activation and expiration date/time. To start the imaging process automatically when Jamf Imaging is opened on a computer in the scope, select the Image Automatically checkbox. Select the Computer Names payload and choose a method for assigning names to computers. Computer names are assigned as computers in the scope are imaged. (Optional) Use the Purchasing Information payload to specify purchasing information for computers. This information is stored in Jamf Pro for each computer imaged using the Imaging PreStage. (Optional) Use the Attachments payload to upload attachments to store for computers. Attachments are stored in Jamf Pro for each computer imaged using the Imaging PreStage. Select the Install payload and configure the basic imaging settings, including the target drive, the configuration to image with, and the distribution point to download files from. To store the imaging settings as Autorun data for each computer, select the Store PreStage settings as Autorun data checkbox. Then configure additional options for Autorun imaging as needed. Click the Scope tab and configure the scope of the Imaging PreStage. 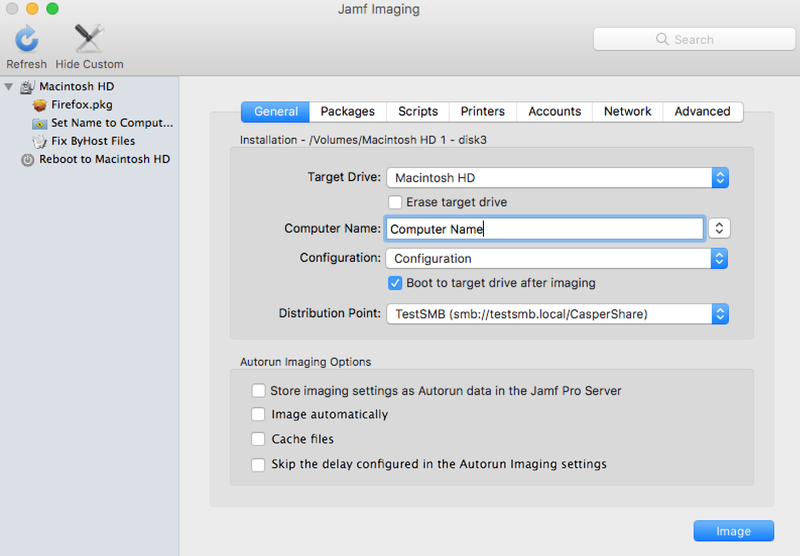 If you configured the Imaging PreStage to start the imaging process automatically, simply boot the target computer to a startup disk other than the target drive and open Jamf Imaging. 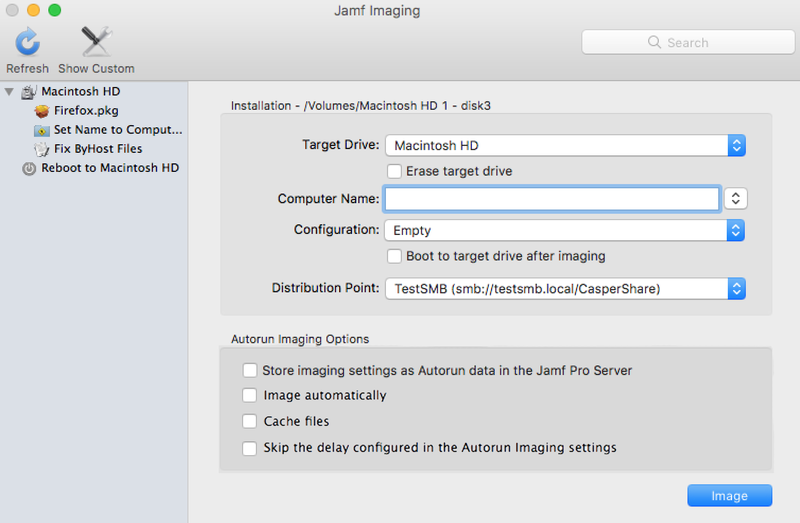 On a computer that is in the scope of the Imaging PreStage, boot to a startup disk other than the target drive and open Jamf Imaging. To bypass PreStage imaging, hold down the Shift key when opening Jamf Imaging. Click the Imaging PreStage you want to view logs for. A list of computers imaged using the Imaging PreStage is displayed. To view the list of actions that were performed when a computer was imaged, click Show for the computer.